Remember the discussion about time machines one or two days ago? Would this be a Sign or a coincidence? HAL9000 wrote: However, it doesn't particularly matter. All who noticed/discussed the difference (including some who had one tab with the first frame [i.e., a page that hadn't been reloaded since the update] and one tab with the second frame open) remarked that the only changes were slight shifts in the arrangements of the characters' limbs and the line thicknesses. Not too great of a loss, in all seriousness. But Time is Seerius Bizness! So unless its a made up frame someone made as a joke it must be the real first frame. Then we do have it! YAAAY! My thanks to the .gif'ers! But we'll probably never know the hash of the image. Shame. EDIT: pope? Not again! I was just about to coma! Of course, this can only be attributable to human error. EDIT2: the last two pages have me as pope. The two before that are both imjb1964. Perhaps we have reached a period of LongPopes, governing for two Newpages. The explainxkcd wiki here to save the day! The first image never had a hash value. While every other image is named by their hashes, the first image was saved as just time.png. That makes too much sense to be wrong. Thanks! 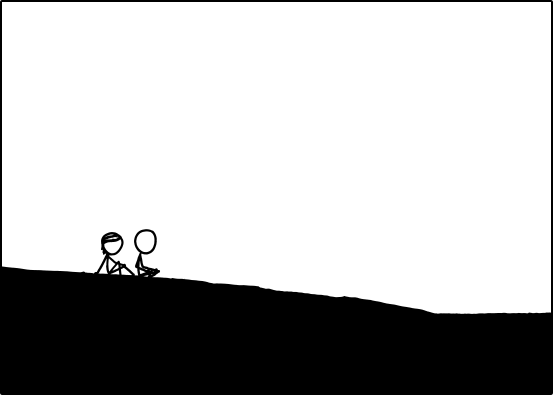 A hooray for the guys at ExplainXKCD! Hooray! Last edited by manvandmaan on Wed Apr 24, 2013 6:48 am UTC, edited 1 time in total. I'm hoping Megan comes back with LaPetite. They can use her ghost powers to scare the sea into submission. HAL9000 wrote: Also, newcomic's up! Does that comic have anything to say to this comic? It's too early in the morning here to try and work out. I'd say if anything it's confirmation for the loopists - at the end of the comic, it looks just the same as at the beginning and you can't tell which it is. Except now the theory would be that it will first run backwards to the first frame and forward to the last frame ad infinitum. azule wrote: I'm hoping Megan comes back with LaPetite. They can use her ghost powers to scare the sea into submission. Yeah that is a cool idea for looping. Gets to some point and they use 'magic' or build a machine to reverse the rise of the sea. 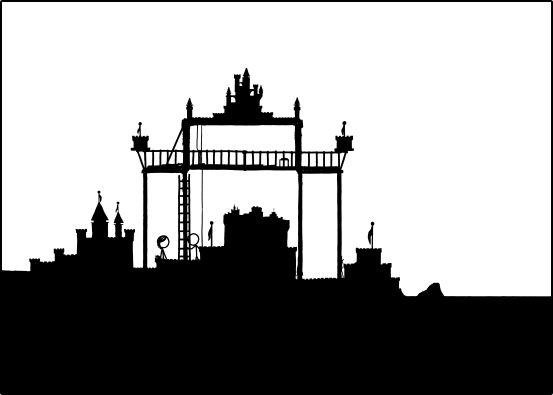 But all it does is make the comic roll out backwards to the first frame and then loop. If there's a group award, I made the same prediction. tman2nd wrote: Staring out at the Sea again? HAL9000 wrote: EDIT: pope? Not again! I was just about to coma! Wasn't the PFAN of the Timewaiters abolished. There's a new church (something like Church of the Newpage) that has a PFAN, but that's decided by the last post. We must warn them about Time machines! To bad they can't read our sigs. But, the first frame. Eh? The "first" frame. Also, then you wouldn't have to worry about something making logical sense for a forward-only loop to work. Edit: changed "post" to "frame" because first I'm stupid then I'm smart, then it goes in reverse ad infinitum. Cueball should dig a moat to trap the sea! Eternal Density wrote: Cueball should dig a moat to trap the sea! Not sure if that would work, since it could escape from that easily, since it's the sea and it can do whatever it wants. I need some help with my periods! I've updated them upto now, but I have no more ideas for the current period. for now it seems to be another Cueball Period. Any ideas for a good name for this period? Beautiful! And with that lullaby, the wee one and I will head off to slumber, while somewhere, while we are dreaming, BlitzGirl will be getting closer, getting closer. Megan arrives with magic scepter. It looks kinda like a torch. azule wrote: Megan arrives with magic scepter. tman2nd wrote: It looks kinda like a torch. The new newpix doesn't help. Cueball seems worried, so probably not just another flag. Surely these need a dedicated page on the wiki!? EDIT: What is she holding? EDIT2: Glad I was the first! That song has been stuck in my head ever since the whole '...ONG' thing begun! The sea can do whatever it wants. Doesn't that mean they should try to convince the sea not to destroy their castle? Guess will have to wait for it and see. Neil_Boekend wrote: The sea can do whatever it wants. Doesn't that mean they should try to convince the sea not to destroy their castle? I'm not sure either of them has enough Charisma to outclass the sea, but who knows, maybe if they crit. Edit: So.... just another flag? Oh well, we can't always have trebuchets. Last edited by Jonas79 on Wed Apr 24, 2013 11:01 am UTC, edited 1 time in total. So it's just a bunch of flags. Last edited by mscha on Wed Apr 24, 2013 11:52 am UTC, edited 1 time in total. Or she should use it to go back and destroy it before it's even built! mscha wrote: So it's just a flag. She's put one on the left-hand end tower on the upper level, and is putting one on the central tower. I guess the assumption is that she has a third one for the right-hand end tower.